Whether you’re ready to remodel or retrofit your out-of-date kitchen or finally add that guest room. 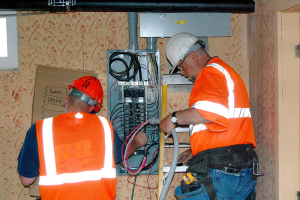 Juniper Mountain Electric is your electrical contractor of choice. Our skilled professionals will work closely with you to ensure your expectations for your design are met. Prior to starting your remodel, retrofit, or addition, always make sure your budget and goals are not conflicting. Electrical designs should include the installation process, and both need to take into account the visuals, functionality, and your needs vs. wants. If you need help, don’t hesitate to ask. We will happily work with you to try to align your budget with your expectations as closely as possible. For more information about remodeling a specific room in your home or business, or if you have any questions about the other electrical services we offer, please call us or schedule an appointment with us today.